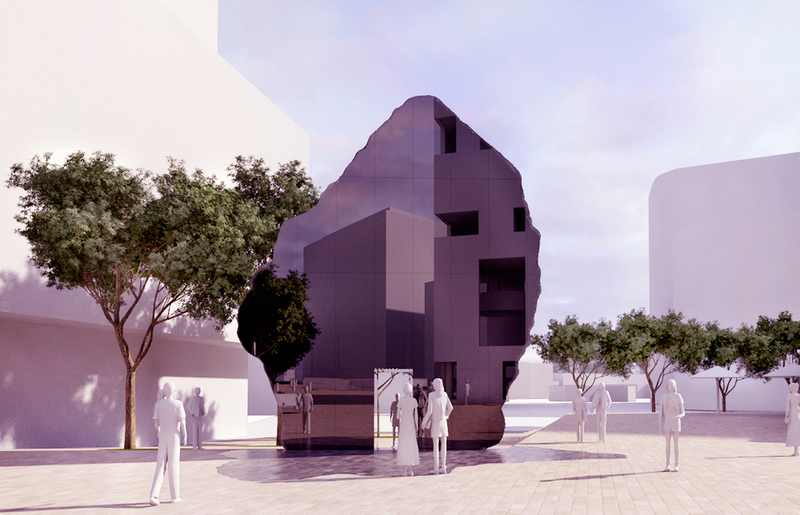 Eunomia was a shortlisted entry for the open competition to design a public art piece at Green Square Library and Plaza, Sydney. Here an otherwordly ‘foreign object’ sits perched atop the ramp leading up from Botany Rd on the site originally marked for the obelisk. Indeed this monolith acts as a type of pagan obelisk marking the space but also as a type of gateway into the precinct. The front surface from Botany Rd is a craggy concrete landscape, with a corridor punched through its base leading through to Green Square. This passage is lined with black mirror glass that produces an infinite reflection as one moves through it. 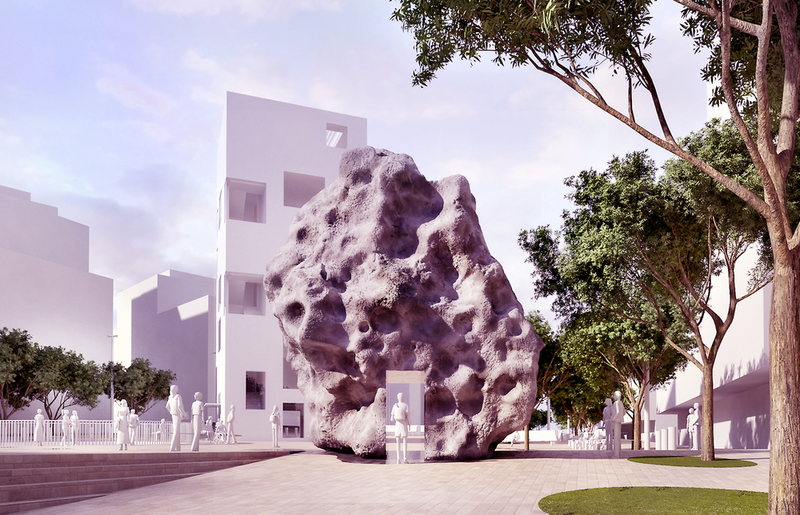 Once through the corridor on the other side, the craggy meteorite becomes flat, as if a geological slice has been removed from its back section. The uneven and uncertain surface has been replaced with the severe geometry of a one-way mirror black glass. The hole for the corridor then becomes a moment of optical and temporal disorientation. The clean geometry of this opening on the craggy side is at odds with the organic form of the rock, while on the other side the hole through the corridor towards Botany Rd has a viewer sitting somewhere between the future (through the passage) and the past receding in the reflection of the glass. At night the one-way mirrored surfaced of the flat slice dissolves and becomes a type of illuminated screen. A dense bank of LED spots that generates heat maps from passers by illuminating the plaza with array configurations.